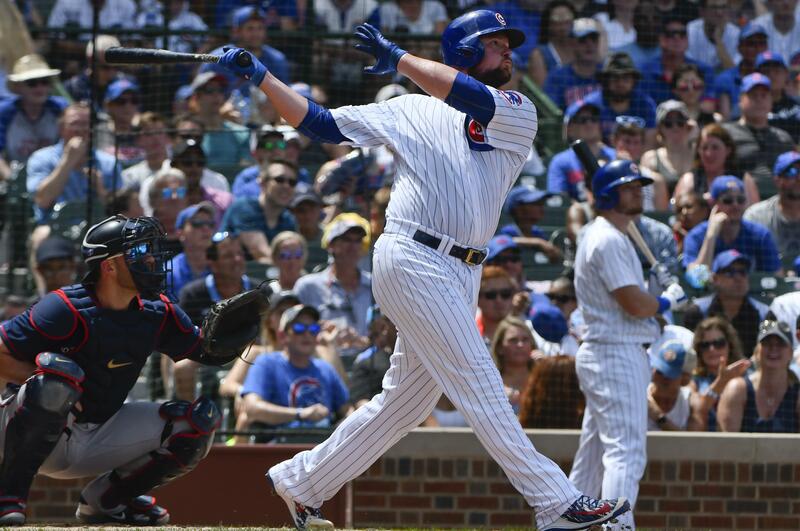 UPDATED: Sun., July 1, 2018, 9:01 p.m.
CHICAGO – Jon Lester hit a three-run homer in an eight-run second inning and wound up with his NL-leading 11th victory in the Chicago Cubs’ 11-10 win over the Minnesota Twins on Sunday. ST. PETERSBURG, Fla. – Blake Snell struck out 10, reliever Diego Castillo fanned Jose Altuve in a key spot and Tampa Bay beat Houston to end a homestand. LOS ANGELES – Matt Kemp had three hits and drove in four runs, including a go-ahead homer leading off the eighth inning that rallied Los Angeles past Colorado to prevent a sweep. PHOENIX – Brandon Belt and Joe Panik drove in two runs each and Hunter Pence had a pinch-hit, two-run double, leading San Francisco to a series sweep against Arizona. BALTIMORE – Manny Machado and Mark Trumbo hit consecutive homers after the Angels lost a popup in the sun, and Baltimore beat Los Angeles to end a seven-game losing streak. SEATTLE – James Paxton limited Kansas City to two hits and struck out 11 in eight innings and Seattle beat the Royals for its season-best seventh consecutive victory. OAKLAND, Calif. – Francisco Lindor homered and hit two of Cleveland’s 11 doubles and the Indians ended Oakland’s six-game winning streak. ARLINGTON, Texas – Matt Davidson hit a two-run double in his second straight three-hit game to lead Chicago past Texas. PHILADELPHIA – Pinch-hitter Andrew Knapp homered just inside the right-field foul pole in the 13th inning to lift Philadelphia past Washington. CINCINNATI – Jose Peraza kept up Cincinnati’s parade of grand slams, sending Matt Harvey and the Reds over NL Central-leading Milwaukee. MIAMI – Steven Matz and three relievers combined on a four-hitter and New York beat Miami to escape the NL East cellar after a one-day stay. ST. LOUIS – Mike Foltynewicz threw five shutout innings and Freddie Freeman homered in Atlanta’s victory over St. Louis. TORONTO – Nick Castellanos hit his fourth career grand slam, Jordan Zimmermann pitched seven strong innings and Detroit beat Toronto to snap an 11-game losing streak. JaCoby Jones hit a two-run homer to help the Tigers win for the first time since June 17. SAN DIEGO – Colin Moran hit his second grand slam of the season and Corey Dickerson and Elias Diaz also homered in Pittsburgh’s victory over San Diego. Kyle Crick (1-1) pitched 1 1/3 innings for the win. Felipe Vazquez worked the ninth for his 17th save. NEW YORK – Aaron Hicks hit three home runs and the New York Yankees pummeled David Price again, connecting five times in the first four innings on the way to a rout of the Boston Red Sox. Published: July 1, 2018, 8:13 p.m. Updated: July 1, 2018, 9:01 p.m.